I ended up spending more time than expected at the mural, but I did get up to the Studio for a few hours this afternoon. After finally cutting the railroad crossing gate, today's focus was the Ranch Wagon. 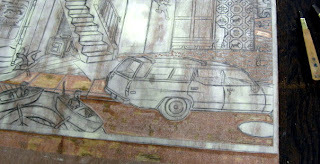 I had done the original drawing from the family photo album, which showed the car just like this (facing the passenger side), parked in the driveway of the house we had in 1972. 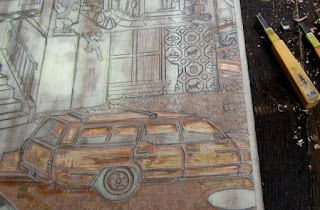 I kept it this way on the block, figuring it will be reversed in the print, so it will appear parked by the curb, driver's side out. One problem- the driver's side should have a rear view mirror and my photo didn't, as passenger side mirrors weren't standard then. Because I hadn't gotten around to drawing that, I had previously put off cutting the car. But today I did some quick online research before heading out, to see what a '69 vintage Ford rear view mirror looked like, and added the mirror to the drawing this afternoon. The cutting of the car was otherwise routine. Looking at the photo now I see that I didn't finish the luggage racks on the roof, but otherwise it's done. 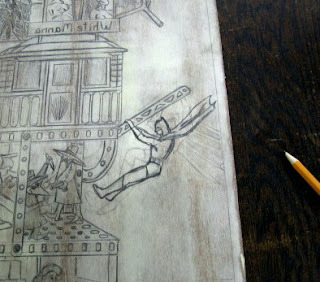 Spent part of the week exchanging e-mail with our chair on the topic of what was left to do on this part of the mural. The conclusion was that it would be good if I could tighten up the area by the rail bridge counterweight, mostly cleaning up the bits of white space between colors. Easy enough, but I thought I should do more. The dark beams in front of the counterweight were never really in perspective, but the addition of the 3D wood piece really emphasized this. See the old version here. So after consulting some of our reference photos, I repainted much of the area. The counterweight's size was increased, beams were extended or relocated, and some hint of shadow was put in to enhance the 3D effect. The perspective is still not perfect, but it's better, and I filled in the gaps in color. It's done. Previously I had always worked late in the day, but this was my first mid-day shift. We had avoided these through the summer, but while the weather was sunny today, it was much cooler than it had been. Got warm up there, but tolerable. The bigger problem is that the strong sun resulted in dark shadows cast by the 3D piece, obscuring today's work area when I was painting it, as well as when taking the above photo. I've also included a photo of the area by the large boat, showing the wooden piece attached to the bow. 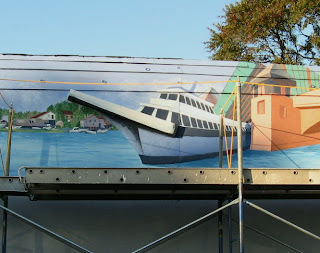 The area above the boat is the last thing needed on the upper area of the mural. 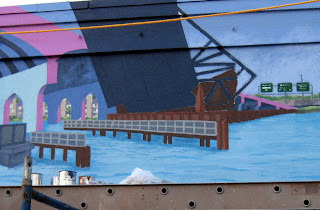 The back bridge tower is incomplete, as is a piece on top of the boat. Someone else will do those this week. Made some good progress on the tower block today. I started (top photo) with the area in the lower right corner of the block, the street. Before cutting I considered adding some structures, such as a manhole and a sewer grate. The grate came and went. The manhole moved a few times, but found a place. I cut around it for now, and I'll fill in the details and cut the cover later. Next was the sidewalk/curb that connects the street and the boardwalk, as well as the little piece shown going around the back of the tower. Then I dealt with the grassy area just beyond the station wagon, pausing first to put in a couple of rabbits. (one had been lightly sketched in before, fixed up that one and gave him a friend, both based on the rabbits in my September 11 print) I also cut the little bit of land in front of the railroad tracks. Dropped by the Studio for a short after-work cutting session. Finished all the boardwalk boards. 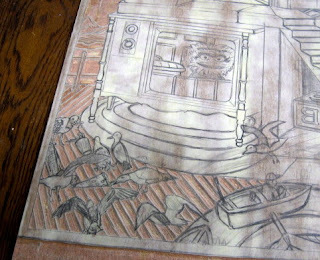 The students from Molly's new etching class started arriving around 6:30. I can always work at my own table while her classes are going, so that's not a conflict. But I had other things to do, so I decided to leave off there, deal with the gulls (and maybe more) on my next visit. Sorry things have been a bit slow here on the blog the past week, but I finally had time to get into the Studio today and resume cutting the tower block. I began by finishing all the cloud areas, now all cut just to leave the external contour lines. 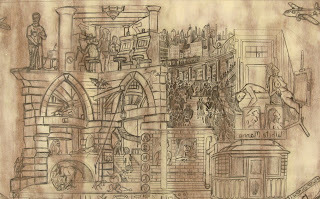 That includes the area above the Masereel city in the upper right corner of the top photo. After a brief break to grab a couple of slices across the street, I decided to turn my attention to the area around the base of the tower. In this case, that meant a section on the lower left of the block- my Hokusai wave and mountain, the beach in front of it, and the boardwalk up to the edge of the gulls. I'm hoping to get some midweek cutting in this time, probably dealing with those gulls and however far I get past that. 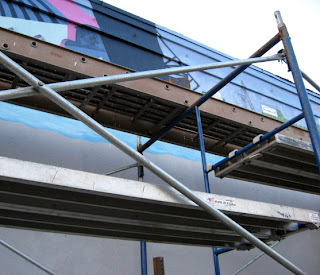 Took advantage of the nice weather to stop by the BAC after work and continue on the mural. The biggest change since my last visit is obvious, that wooden extension piece (courtesy of mural pro Bob Mataranglo I believe) that has been added to the wall, taking the image above the roofline. I believe the plan is to do something like it over on the other side where the Main Street drawbridge is up. My goal was to repaint the same things I did last time, but make them better. The second photo shows the areas I dealt with today. 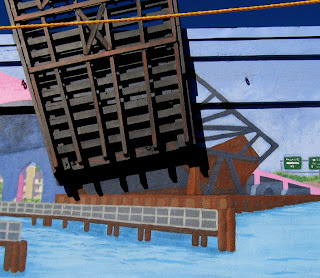 I worked on the area under the wood attachment, the brown bulkhead structure under the bridge, making the structure more regular and fixing the shadows to bring them in line with the viewpoint of the rest of the painting. 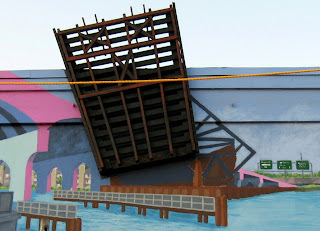 The other main area of concern was to the right of that, the pink ramp leading down off the high route 35 bridge. Got to use a new color from out Siperstein's supply today, Autumn Sedum (the pink color). I repainted all the pink, moving one of the supports back a little in space and adjusting line thicknesses to make the perspective a little more logical, and then repainted all the blue colors (blues and browns same as last time) on the supports underneath. I'm satisfied that both these areas are fine. I also did some touch up on the gridwork of dark beams that spans the two previously mentioned areas, which had been partially covered with the sky color that had been scumbled on. With that done, and the air getting a little chilly, I called it a day. Besides, I need to find out how much more there actually is to do on the upper half. I'd think we're just about ready to take down the scaffold and start working on the undersea portion. Went back to the Studio after the debacle that was the Giants game and continued on the sky areas around the tower. This time I was on the left side of the block, starting down by Mt Fuji and the wave, and moving up to meet the janitor. The chisel didn't bother me as much today- must be getting used to it. By the end of the session I had cut all the parts that will be blue sky, and started cutting a little bit within some of the clouds. Next time I'll finish those and start dealing with something solid. An exciting day today- the first day of cutting. Started with the top and bottom borders. Then I decided to deal with the negative space, specifically the sky. As I looked at it, I decided that the sky areas are an awful lot of empty space to be filled with blue, really too much. Some clouds would break up that space, make it easier to ink and print, too. At first I looked at Bruegel's original painting, but the clouds were a bit too heavy for the mood I'm seeking. Since today was a gorgeous day, I went outside and sketched some of the puffy clouds in the overhead sky. I added these to the drawing. I figure do this now, because I can always take them out later if I don't like them. (other parts of the drawing changed- I added a new gull based on one I photographed at the boardwalk the other day) With the sky settled, I began cutting on the right side, around Castelnuovo and the highway signs, working my way up the tower and over the top, ending today at the upper left corner. It turned out that the surface veneer is firmly glued down over every inch. 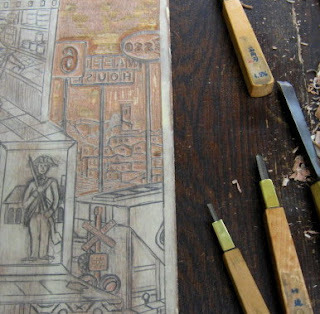 The advantage of this is that it's less likely that detail areas will flake or splinter off. 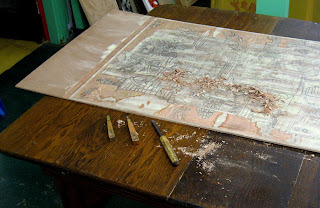 The disadvantage is that cutting out wide areas with the chisel takes a bit more physical effort. My index finger was getting sore, so I gave up where I did, rather than risk getting a blister. The gouges caused no discomfort, so I just used those for the last portion of the day. Things should be fine when I return to the Studio, maybe as soon as tomorrow. Today was one of my long teaching days, an afternoon class and an evening class, so getting to the Studio was not a possiblity. 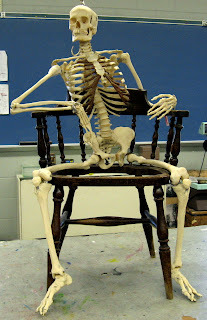 But my studio chair (minus its seat) saw some action, as a resting place for the skeleton I used for the first day of drawing in my figure class. Hoping for a live model next week, sitting on something a little more supportive. After work today I went down to the Point Pleasant boardwalk to do a little research toward a future print project. Getting there was considerably easier than last time- no traffic and plenty of free parking in the Jenkinson's lot. Not as crowded as my summer visit, but far from empty on this beautiful day. 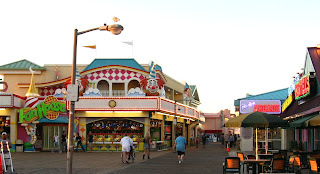 About half of the businesses weren't open (including the ride park), but there were still several games running, 3 or 4 arcades, some of the souvenir shops and food stands, and all the larger restaurants. I did a bunch of sketches and took some photos as well. These are not likely to serve directly as references, but rather things for me to consider as I work out ideas for this possible series. I'll save the details of all that until I'm ready to start, probably months away. Back to the Studio for a few hours this afternoon. Today's effort was directed at the upper third of the tower (top photo). 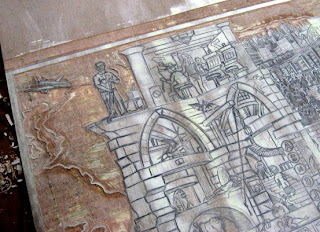 Consuming most of the time was working on my Piranesi inspired prison. I completely redrew the large arch on the left, and also adjusted the horizontals on just about every block to bring some consistency to the point of view. I still haven't figured out how I'm going to assign light and shadow in there, but I decided for now to make that a coloring issue rather than a cutting issue. I cleaned up a few lines on the slot machines in the casino above, as well as resolved the ceiling a little more. Over at the upper right corner I made some minor adjustments to both of the models. So that concludes the round of major revisions, bringing the drawing to the state shown in the second photo. That doesn't mean I'm done drawing- I'll likely look again at each area, even bringing back source material, before I cut many of the areas. And there are a few details I know I have to fill in (such as a rear view mirror for the station wagon). But I do know that all the main elements are in place, so I don't have to worry that late changes to one area will affect other areas. Which means that I can begin cutting next time. Luckily that shouldn't take as long as the drawing did. A short visit to the Studio this afternoon, after a few days away getting started with my fall classes. I made subtle corrections to a few portions of the tower, most of which are not worth mentioning. 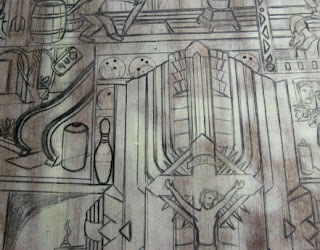 The most obvious change was the area shown above, the bowling equipment. I replaced four rows/racks of small bowling balls with two rows of larger ones (the not fully erased originals can be seen in the photo) and a bowling pin. 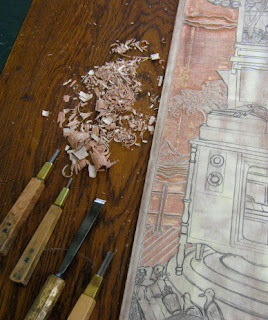 I'm planning to be back there tomorrow, maybe finish all the revisions so I can begin the cutting. Some of my time in the building was spent looking over the latest version of the ad that will promote all the artists in the building. I pointed out one change Molly wanted, and some inconsistent text point size, but otherwise it looks really nice. I put in a few more hours on the mural today after work. Since my last shift the houses in the deep background in the center and right parts of the painting were finished in detail, probably more than needed, attributed by one of our consultants as the result of "easel painters doing a mural." We're happy anyway. The other significant difference is that Pat has been making changes to the tower on the Main Street drawbridge, raising the roof higher. She was working on it for a while tonight as well. Click on the top photo to see all these details. Tonight I contined to work the area around the base of the raised railroad bascule bridge. I took what was mostly the solid pink color of the road at the far end of the bridge and put in the shaded concrete supports, using some straight Grand Grape, and some combined with one of our water mixes (South Port blue and Cottage White). I also put in some detail with the wood around the base of the bridge, using some of the blue mixes and some other Siperstein's colors- Chamois Shirt and Soul of the Earth. (second photo shows all this) It's an improvement, but all areas need a little more work, mostly in straightening some lines and adjusting the spacing to improve the perspective. I'm always advising my students to step back from their drawings and get a better view of how it's all working, but that's hard to do when you're up on the scaffold. It's a long way to ground, whether you climb down the levels or fall off. It's much easier to see the flaws from the ground, and next time I'll fix them. Busy night in the basement tonight. I actually got to the Studio in the late afternoon and put in some time on my tower block before others started arriving. 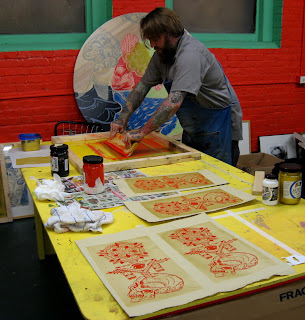 First was Rob, one of Molly's recent students, there to do some silkscreening. Molly arrived shortly after, to get him set up with a lesson or two about registration. 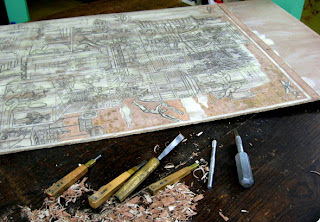 Molly had a project of her own to work on as well, a new tabletop woodcut piece, still in the early stages. But Molly had to put that off for a while as we had another visitor, Mike, who saw her work at Exhibit A in Asbury and wants to learn everything she can teach him. While she was showing Mike all the possibilities of printmaking, Rob got down to business with his print, first laying down some metallic gold, then overprinting the red skull design, as seen in the top photo. And squeezed in between all this, Molly and I sat down to discuss the text for an ad that will be running next month. Despite all this, I did get some work done on my block. Today I was concentrating on a section on the lower left side. First was the art nook, adjusting the game board path, cleaning up the little boy and his clothing, and redrawing the easel. Next went to the right and did a little more with the continental soldier artwork, mostly fixing the building behind him. Then I jumped up a level to my barbershop/supermarket scene. 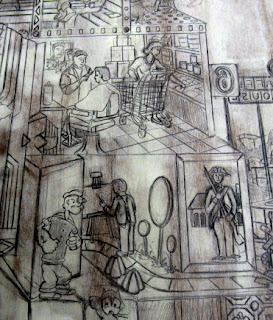 Cleaned up some of the sketch of the figure and barber chair, but spent most of my time on the woman shopper behind the cart. I had long thought the first version was too large, but this figure is more to the scale of the rest of the scene, and the pose is changed a little, too. Spent a little time on the shelves around her. Still have a few details to work out, but I'm much happier with this than I was. Today began the revisions and fixes on the tower block. I dealt with two thing that had been bothering me for a while. 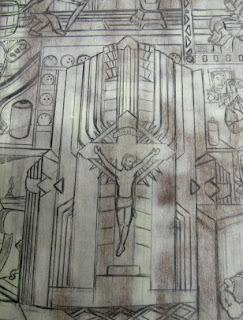 First was the celestial elevator, the large structure with the crucifix in the lower center. The design was good, but it was a little crooked, especially when compared to all the other verticals. I tried doing minor adjustments, but in the end I had to redraw most of it to get it right. The top photo shows the results- very subtle changes, but it helps. Second change is more obvious, the Batman figure halfway up the right side. 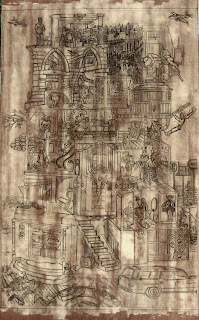 I had decided that the version I had before was too big relative to the space and other figures in the piece. The new version is a little smaller and a different pose that takes up less overall space. There's enough of the erased version still there that you can see the difference. I definitely like this one better. Many more things to fix, but those will wait for another day.